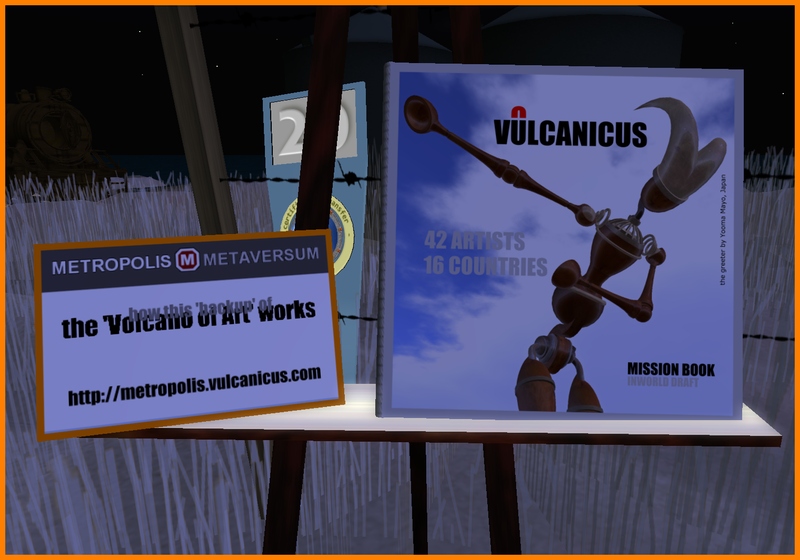 Everyone is invited to visit VULCANICUS – ‘The Volcano of Art’ via the Metropolis grid. Central Map name is RIFT HORIZON. Then look south to see VULCANICUS on South Horizon. Enter South Horizon on your own risk as there is an older server edition running. You might get ruthed! In ‘The Volcano of Art’ you find pieces of art made by: Ivrai Abramovic, Minethere Always,Bonafidenutts Aries, Rob Balder, Sisi Biedermann, Ray Blue, Wizardoz Chrome, Fiona Blaylock, Art Blue, Feathers Boa, Navah Dreams, JadeYu Fhang, Reezy Frequency, Cold Frog, Garvie Garzo,Wizard Gynoid, Issis Karu, Met Knelstrom, ChapTer Kronfeld, Nicci Lane, Excess Lemmon,Gaianed Lindman, FreeWee Ling, Ggabriel Madruga, Attard Magic, Birki Magic, Fontana Magic,Mdina Magic, Mosta Magic, Mimesis Monday, Cherry Manga, Yooma Mayo, Meilo Minotaur,Fuschia Nightfire, Soror Nishi, Bryn Oh, Nanjido Oh, SaveMe Oh, Neo Prim, AM Radio, CapCat Ragu, Aley Resident, Creative Starfall, Renn Yifu, … [and more, see starting page].